It never seizes to amaze me how much there is to find in this flameworked glass bead. A whole world of sea life flow in the currents of this Deep Blue Tide Pool bead by Nina "Sam" Hibler. Perspectives, a juried exhibition sponsored by the International Society of Glass Beadmakers's (ISGB), encouraged artists to create a bead capturing their inspiration, innovation, and personal voice. This collection is on display June 5 to September 7 at the Radisson Hotel in Corning, New York, as part of the Glass Art Society (GAS) Conference. Other recent ISGB shows which included Sam's work are Metamorphosis - the Life Cycle of a Bead and Out of the Box - Pushing the Boundaries of the Glass Bead. Just two boxes away from having a complete online record of the San Antonio Calligraphy Guild's (SACG) Library online at Libarything.com. As a life long book lover it has been a pleasure to have the opportunity to touch each of these books, flip through their pages, and when possible read them cover to cover. No wonder it has taken me so long to get them entered. But regardless, here are a few of my favorites from boxes 3 and 9. 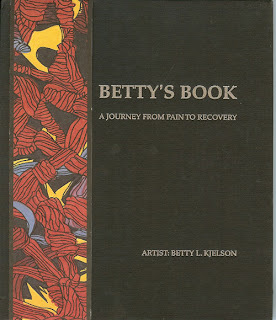 This limited edition signed accordion book by Betty L. Kjelson beautifully depicts the struggle faced in the painful journey to recovery made by the artist after an accident caused her severe burns in 1991. The book's illustrations come from gouache paintings created by Betty between 1992 and 1999. The vivid visual messages are accompanied by the poetry of Charles G. Ward Although what drew me back to this book repeatedly were the vibrant colors and bold strokes in the images, which tell a story by themselves. We can all relate, as there is not a one of us that has not experienced some physical, mental and/or emotional journey of recovery. The threads that weave through this book are part of the fabric that makes up our lives. The vertical belt gives you just a little taste as to what you will see inside. Opening this book you will see a small window into Betty's experience and quite likely a mirror to your own. The SACG book collection is just full of these small self published books from years ago that would likely disappear if not for collections such as this. If you know me even a little it can't be hard for you to see my interest here. Spirals permeate the world of Calligraphy. 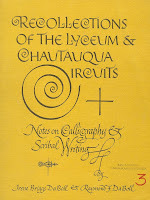 In the title of this text they are used in the flourishes and to form complete letters. I will admit this is a book I judged by it's cover. With my hands on so many books in a frenzy to get them entered online, I only skimmed this ones pages. I'll be back later to delve more deeply into it's history and knowledge. Now this is a book I truly enjoyed. 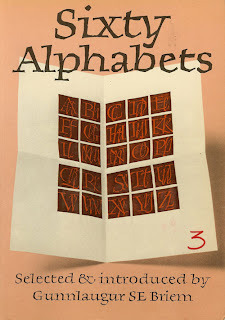 Printed in 1986, Sixty Alphabets highlights 60 different calligraphy artists from all over the world. Each artist is given two pages, one to discuss the artist and the other displaying a sample of their work. As much as I enjoyed seeing the various hands displayed for each artists, I also found reading the various bios and seeing the artist's portraits, sometimes photographed and sometimes sketched, fascinating. After reading this book I found myself searching the Internet to see if I could find out what some of these artists are doing now. Sitting in the shade among the completed and in progress work of sculptors, mosaic artist and painters at the Gevers Street Studio was the perfect venue for a San Antonio Visual Artists (SAVA) brainstorming session. 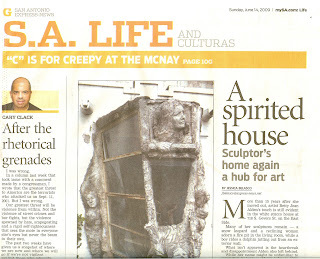 And no better day to be at 718 South Gevers Street as they just received a fabulous write up on the front page of the Express News S.A. Life and Culturas section. It was intersting to sit amough both historic work of Betty Jean Alden and the contemporary work of local artists like Jeremiah Heye. Congratulations to the all the studio and associate artists at the Gevers Street Studio, including Christian Deworde Withers. After two days of leading my students at Wired Designs tip toe through the room where visiting metal clay instructor Barbara Becker Simon was teaching, on our way to kilns or cold working equipment, my curiosity was peeked. Okay honestly, I was interested by the end of day one. Day two I was lingering in doorways to get a peek. So naturally I had to pick up a copy of her newly released book, Metal Clay Beads, to get a better idea as to what exactly they had been up to. I've just started flipping through it myself, but already I am impressed with the quality of the content and printing. I look forward to sitting down for a clay play day some time this summer and you can beat I'll have this book by my side.